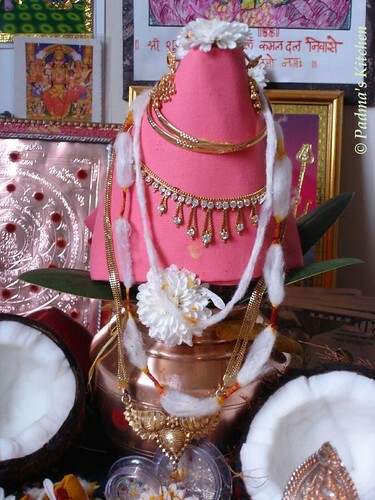 Varalakshmi Vratham is a popular ritual observed by married women in South India and Maharashtra. Goddess Lakshmi – the goddess of wealth and prosperity – is worshipped on this day. In 2007, Varalakshmi Puja is on August 24. According to Hindu mythology, once Goddess Parvati asked Lord Shiva about a vratha that will be beneficial to women. Lord Shiva then mentioned the importance of Varalakshmi Vratha. The conversation on Varalakshmi Vratham between Parvati and Shiva takes place in the Skanda Purana. The Hindu mythological story about this vratham you can find it here. Varalakshmi literally means the boon granting goddess. Worshipping Goddess Lakshmi on this day is equivalent to worshipping Ashtalaksmi – the eight goddesses of Wealth, Earth, Learning, Love, Fame, Peace, Pleasure, and Strength. It comes in the holy month of Shravan on the first friday before the full moon (Pournami/ Poonam). We generally buy something in gold and offer to the Goddess Lakshmi. 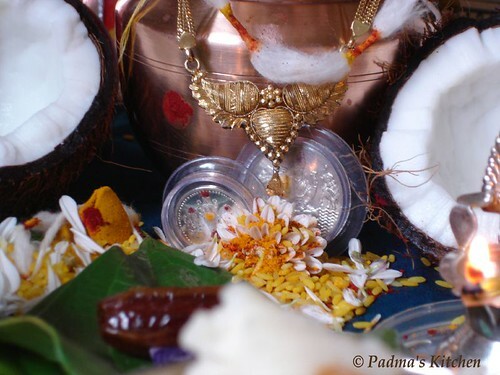 We do Alankaranam with all the jewelery and offer saree, prasadam/ naivedyam, differnet varieties of fruits and Thamboolam – betel leaf, areca nut, flowers, pair of banana/any fruit, turmeric, kumkum, coin, khajoor – is offered to women in the locality and in the evening an arati is offered. To know more about this puja you can find it on telugu bhakti and carnatica and for step by step puja vidhanam click here. I thought of sharing few snaps of the puja performed at my home, since this puja was followed by weekend and one of our friend visited us, I was not able to post it on 24th August. 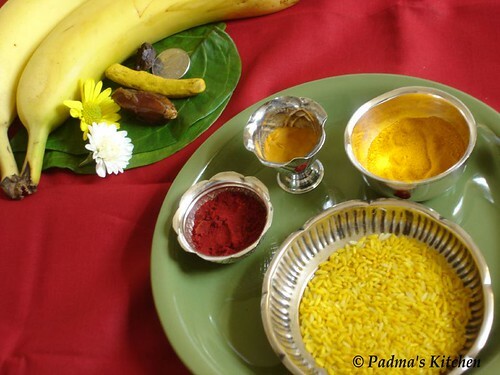 I made 5 varieties of naivedyam, offered 7 kinds of fruits including coconut and bananas. can you also see the pasupu ganapathi! Thanks for sharing your puja with us. The pictures are beautiful. Brings back lot of memories. My mom used to have a silver face of the goddess for this viratham. My MIL's side don't celebrate this though. This is such an honour for me that you share this... something this intimate. Thank you very very much, Padma. Nice to have a glimpse into your pooja ! nice pics! It just slipped out of my mind to take pics. besides I was exhausted. Gorgeous pictures padma, looks like you went all out! Really interest and thanks to share us. In my country, people in Bali are used to make puja in the earlier morning, almost 90 persen the population people in Bali are Hindus. Such a devine post Padma! Beautiful pictures! Padma..so nice of you to share this with us....everything looks so wonderful. You have such a beautiful pooja room and those pics are absolutely lovely. 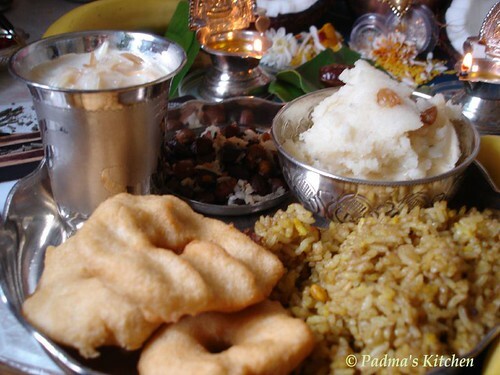 Beautiful pooja pics and prasadam! Ammavaru looking so beautifull padma!!! the food plate is also looking yummy!!!! Thanks Saju, Tee, Latha for your valuable comments. Asha, glad you liked the jewelery, I was so exhausted so I didn't take much efforts in getting beautiful pics. Suganya I am glad that those pictures refreshed your fond memories! 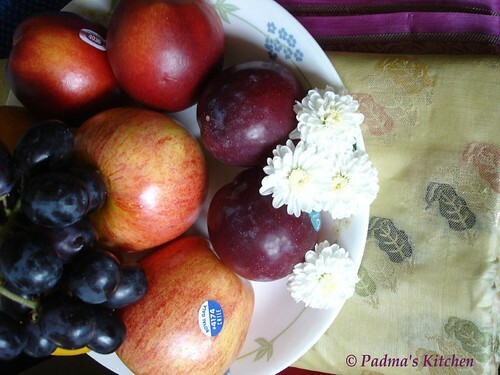 Cynthia dear, I am really honoured by your kind words...believe me first I was thinking not to post it on a food blog..
Hey, my friend Rashmi did this at her place and she had used a beautiful Lakshmiji mask on a coconut, and her rawa idlis were awesome!! nice post, its great to know about festivals that others celebrate! Wow. I love the photos. Thanks for sharing all the information with us - I have to admit I didn't know much about this before your post! Lovely pics, Padma.....Thank you for visiting my blog. You need to drop little unevenly shaped bits of the ragi pakoda dough in hot oil and fry until golden brown. I do have the instructions in the post...don't know why it didn't show up when u were reading. @ Manasi D, thanks for you time, yeah I didnt bring Lakshmi's face, next time I visit India I have to bring it for sure. 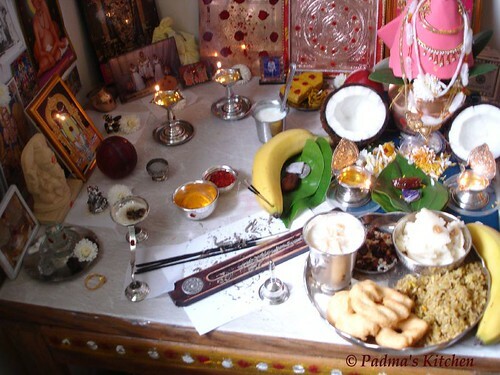 Hey Richa, I am glad you felt like you attended the puja, hope you liked my virtual thamboolam! Very nice puja decoration and nice pics..
your pooja place looks great! the prasadam plate is inviting too. your kalasham looks so different nice one. Padma i was browsing by to find out more details and pooja vidhanam of varalakshmi varatam, so happened to visit ur web blog. i have seen the photos they are very neat and looks like u have performed the pooja very well. hope Goddess has showered all her blessings to u.
I too liked the online taamboolam. thanx for giving online taamboolam. This morning the first thing I did was open your blog and I was so glad I did that. You really have talent there. I saw your last year's varalakshmi puja page and find it so beautiful. Thank you for inviting me for this year's puja. The prasadam was all so good. We wish that may Goddess Lakshmi shower you with blessings and fulfil your wishes. Lakshmi is the goddess of wealth, fortune, power, luxury, beauty, fertility, and auspiciousness. She holds the promise of material fulfillment and contentment. She is described as restless, whimsical yet maternal, with her arms raised to bless and to grant her blessings. Look what I received........tim tam and an award!